Run and cumulate 2,000 meters of ascent in one month and you’re entered to win an exclusive Raidlight backpack. Summer is the season for sport – to take on some big days and push yourself. 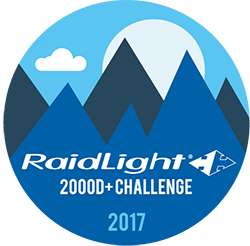 If you’re keen for some climbing, join our very first Raidlight 2,000D+ Challenge and try to win a Raidlight backpack. All you have to do is climb 2,000 meters or more between June 14th and July 14th to try to win a made in France Responsiv 3L backpack. This is a challenge for guys and gals alike, and the lucky winner can have their choice of the mens or ladies version of the pack. Good luck and don't forget to also join the Raidlight Club to follow the latest news and meet with other participants. Have fun safely. Use common sense when it comes to weather, or other conditions while taking part in this Challenge. Remember to take care of your hydration and nutrition needs when you go out. The game is opened to the whole world, the winners will be drawn on the week following the end of the challenge (week of July 17th) and be announced on our Raidlight Strava Club on that same week.